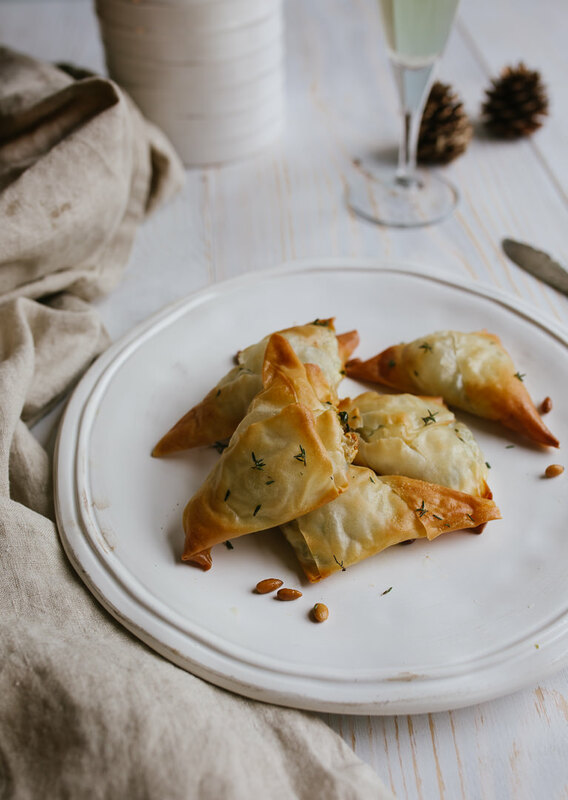 [I] know that Spinach and Feta Cheese Triangles don’t scream festive holiday snack to most people but they are part of my family tradition. Since I can remember, my mother has produced an array of delicious pastry products, baked weeks in advance, which she produces with impeccable timing, just as Christmas dinner is wearing off, the festive *ahem* wine cheer is kicking in and we’re on the third round of Trivial Pursuit. You think you’re not that hungry and then bam! You’ve accidentally eaten a dozen of these crunchy savoury morsels. They are easy to make and fairly quick if you are organised. This year, my first crack at the role of family pastry provider, I got a little production line going involving everyone in the house under ten. The recipe is pretty flexible too. 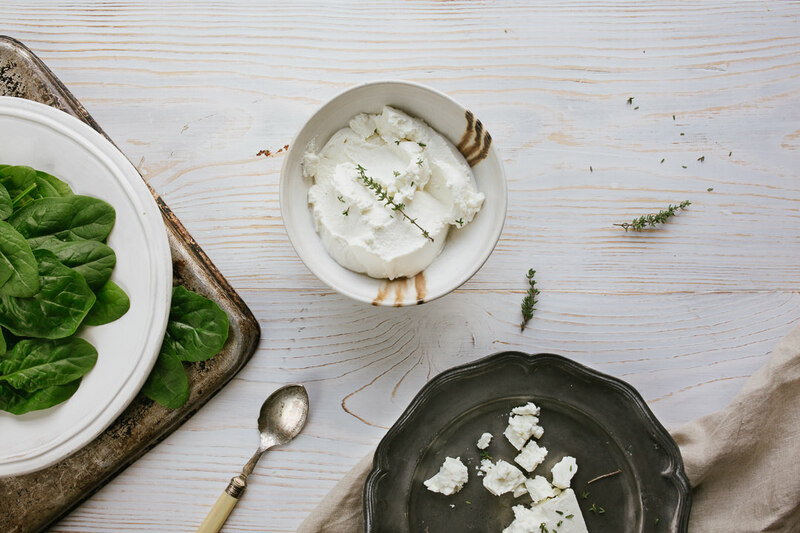 You can use any soft cheese from feta to goat’s cheese or even plain old cream cheese if that’s all you’ve got to hand. We made ours on the small side so you can easily pass them round as canapes and so that you don’t feel guility eating more than one or two. Okay, five. But who’s counting? 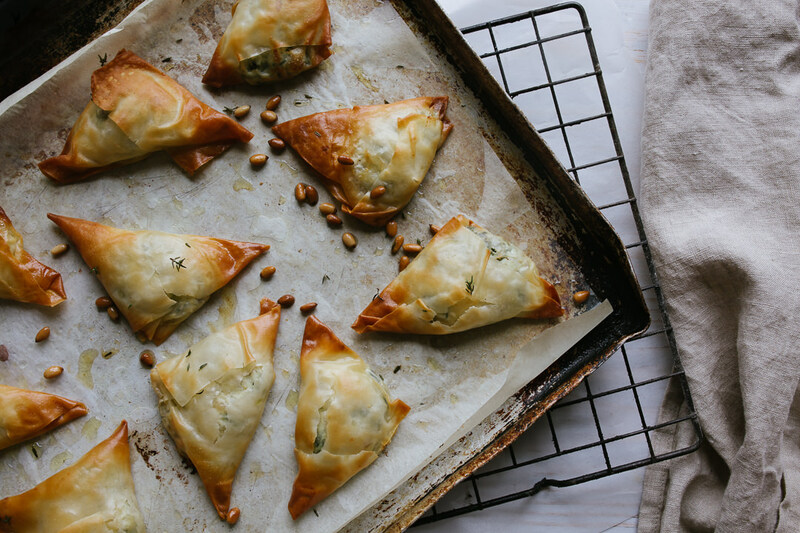 Bonus: these yummy little triangles freeze really well and can be reheated in a warm oven. In a hot pan, add a little oil and gently toast 75g your pine nuts until a little browned, remove from heat and turn down the hob. Finely chop your onion, add it to the pine nuts with a little butter and gently saute until transluscent. Add the garlic, oregano, thyme and spinach to the pan and cook gently until spinach has wilted. Drain any excess liquid and leave to cool. 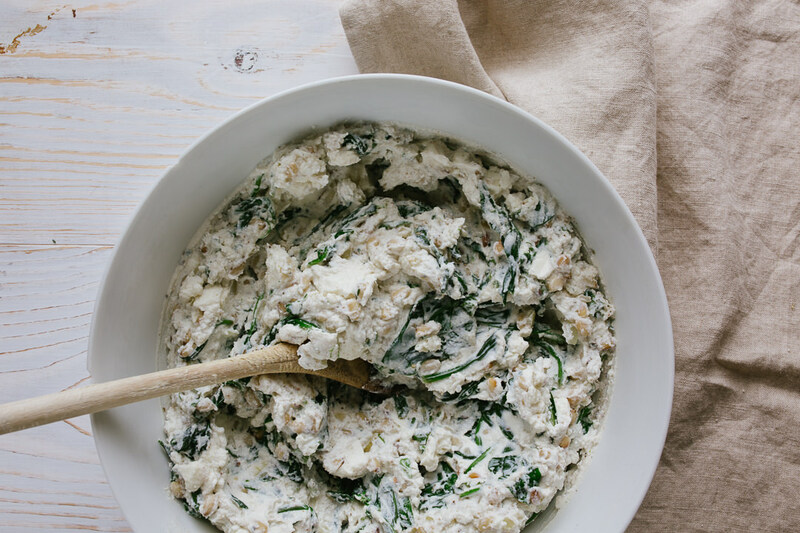 In a large bowl, combine the cheeses, nutmeg and spinach mixture. Season to taste then add your two egg yolks. Mix well. Melt the remainder of your butter and leave to one side. 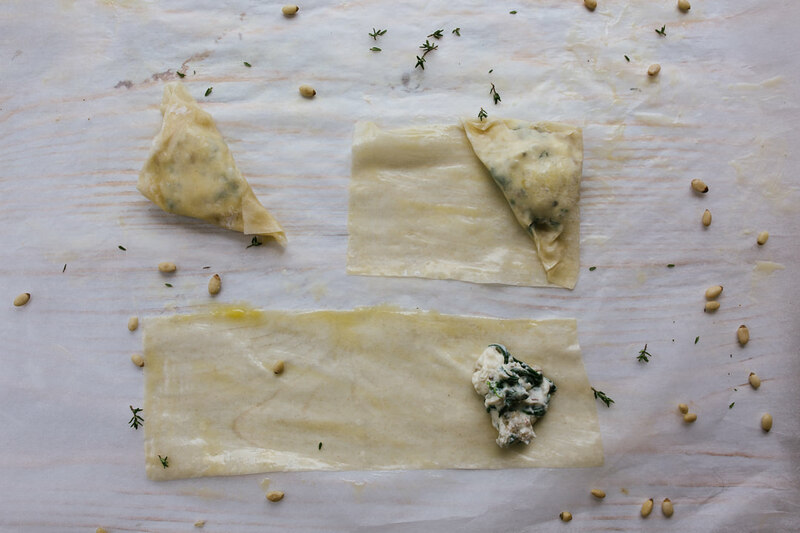 Unroll your filo pastry and cut the layers vertically so that you have three long strips of roughly 7-8cm wide. Lay out a couple of strips and cover the rest of the pastry with a damp teatowel to prevent it drying out. We find laying the strips onto greaseproof paper works well. Brush each strip with melted butter and place a teaspoon full of mixture at one end (see below). Take one corner of the pastry and fold it across the mixture to the other side of the pastry to form a triangle. Press down the sides and then continue to fold the strip into more triangles until you reach the end. Seal with melted butter. Once you have made all of your triangles, lay on a lined baking sheet. 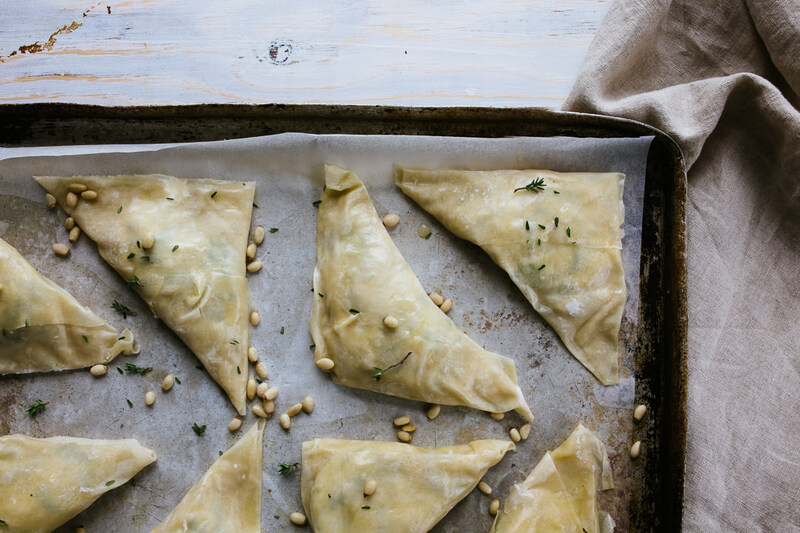 Scatter over a little fresh thyme and extra pine nuts. Bake in a moderate oven for 25 mins or until golden brown. Leave to cool a little and the filo with firm up even more. 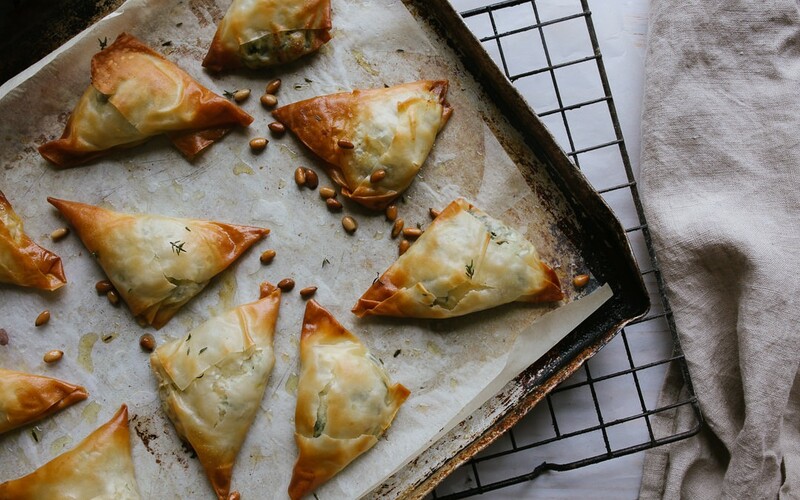 These little feta and spinach cheese triangles look absolutely scrumptious. I can see why they would make a great nibble for everyone as they wait for the Thanksgiving feast or as a wind down during trivial pursuit. I for one think they would be a nice add to my next game night. They are actually super quick once you set up your production line and people go mad for them! Love your last post with the chocolate cake, btw. OMG! These look perfect. I am always a little wary of using filo pastry. I don’t know why, I will happily make my own rough puff or shortcrust, but even frozen filo worries me. Thank you Claire! Give them a try and they’ll work out really well I’m sure.